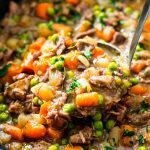 Crock Pot Beef Stew is filled with tender chunks of beef, carrots, peas, potatoes, celery, and savory spices, it’s a wholesome family favorite that’ll keep everyone warm as the weather gets cooler! Trim any fatty pieces off of your stew meat and ensure that each piece is approximately a 1-inch cube. You could also use a piece of chuck roast instead of stew meat and cut it into 1-inch cubes as well. In a large bowl, toss the cubed meat with the salt, pepper, and flour until coated. Add 2 tablespoons of oil to a large deep skillet, once heated, add the meat and brown it over medium-high heat for a couple of minutes on each side to give it a good sear and lock in flavor. Depending on the size of your pan, you may need to cook the meat in two batches. Use this time to prep your vegetables. Transfer the meat to a 6-quart crock pot and return the pan to heat and add the remaining tablespoon of oil. Add in the chopped onion and cook for 4 to 5 minutes until translucent. Add in the minced garlic and cook for 30 seconds. Add in the wine to deglaze the pan and simmer for 2 to 3 minutes. Transfer the onion mixture to the crock pot. Add all of the remaining ingredients EXCEPT for the peas and butter to the crock pot and stir to mix. Cook on LOW for 6 to 8 hours or HIGH for 4 to 5 hours, until meat is fall-apart tender. Add the peas and butter to the stew with about 30 minutes of cook time remaining. Stir the stew every couple of hours, if possible. Remove the bay leaf before serving. Add additional salt and pepper to taste. Enjoy right away, store in an air-tight container in the fridge for up to 3 days, or freeze right away (see notes). You can use 1 cup of chopped baby carrots instead or large carrots. You can substitute the Merlot wine for a stout beer or additional beef stock. If you don't want to sear your meat, you can add all of the ingredients directly into the crock pot. Write the Recipe Name and Date Made on 4 heavy-duty quart-sized freezer bags. Fill the bags with the stew and remove any excess air. Lay the bags flat in the freezer, once frozen, you can stack them as desired. Frozen stew is best enjoyed within 4 months, but is safe to eat indefinitely if stored at 0 degrees F.
To thaw stew, you can either transfer to the fridge and allow it to thaw overnight OR you can run the bag under hot water to loosen it from the sides of the bag and then transfer it to a saucepan to reheat.